NEW CANEY, Texas (AP) — Dry, brown grass crunches underfoot as David Barfield walks through his 45-acre Christmas tree farm pointing at evergreens covered with brittle, rust-colored needles. Now, barely two years after Karen Barfield retired to work the farm, she has returned full-time to her job selling explosion-proof enclosures to the oil industry. David Barfield has increased his hours doing part-time electronic work. Instead of selling some 400 homegrown trees as they do in a good year, they will be lucky to sell 100 — nearly all Frasier firs brought in from North Carolina. And they're not certain that will be enough to cover their property taxes. 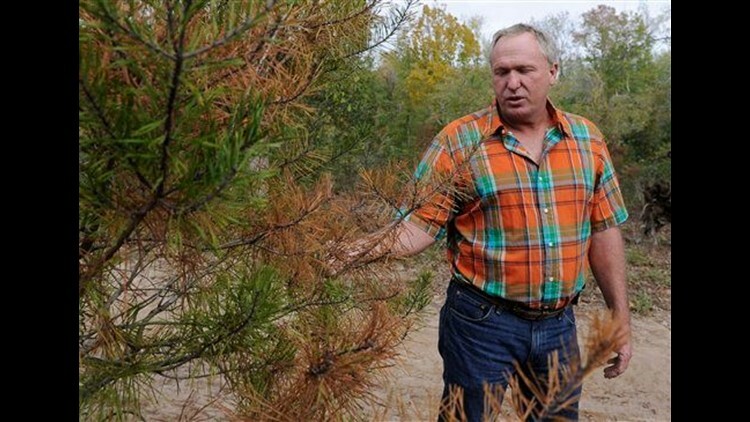 Barfield says he can only charge $50 for a North Carolina fir — just $10 more than he pays for them. Farmers who planted evergreens native to Afghanistan — and accustomed to a desert climate — have had greater success than those who planted trees from the northeast United States. Those who irrigated also are having more modest success, although that costs — about $1,200 a month on a midsized farm. Jan Webb, owner of the Double Shovel Christmas Tree Farm in West Texas — one of the driest areas of the state — said her Afghans have done well. Of the 400 she planted last year, only about 50 died. On the other hand, none of the 400 Leyland Cypress she planted survived. Yet the farmers are determined children will be able to see trees cut for Christmas — even if they're North Carolina firs liberally placed in Texas soil. There will be hayrides and picnics. Christmas carols will ring out and colorful lights will cover the bare branches.